I guess I'm a little obsessed with fresh corn right now. I pretty much want to add it to everything. A few days ago, my sister mentioned that she'd had a pizza with fresh corn kernels on it and I immediately decided that pizza with corn was a combination I had to try asap. So I picked up some whole wheat pizza dough at Capone's this week (Now, I like to make my own pizza dough just as much as the next food-obsessed person, but store-bought can be pretty good too, especially for weeknight meals!) and started thinking about pizza toppings. Corn and tomato is an amazing combination for this time of year so I knew that some fresh tomatoes (from our garden!) had to factor in. Instead of tomato sauce, I decided to layer the dough with sliced tomatoes that would hopefully cook into a "sauce" in the oven. I also added some roasted red pepper and goat cheese to the mix, and topped it off with fresh basil. 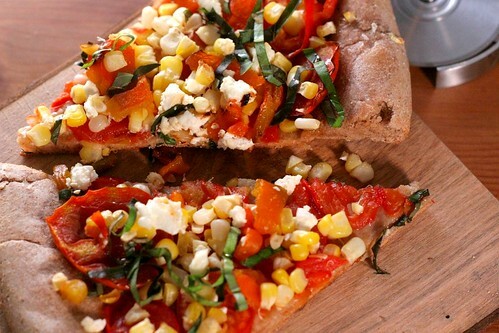 I really enjoyed the pizza - it was light and full of flavor and the sweet corn and tomatoes worked very well with the goat cheese. I really should make pizza for dinner more often! This is a flexible recipe. The amounts I am listing are enough for one 12-inch pizza, but feel free to alter amounts as you prefer. I used store-bought pizza dough when I made this, but if you would like to make your own pizza dough, you can check out this recipe (it's not whole wheat though). If you have a pizza stone, place it in the oven. Preheat oven to 500 deg F. When oven is preheated, place red pepper halves skin side up on a baking sheet and bake until skin is blistered and blackened all over, about 10-20 minutes. Remove peppers from oven and place in a tupperware container or bowl. Cover container with a lid or plastic wrap and let peppers steam for 10-15 minutes. Peel peppers (skins should slip off easily) and chop the flesh. Roll out pizza dough to a 12-inch round and drizzle with olive oil. Spread tomato slices evenly over the dough, leaving about a 1-inch crust. 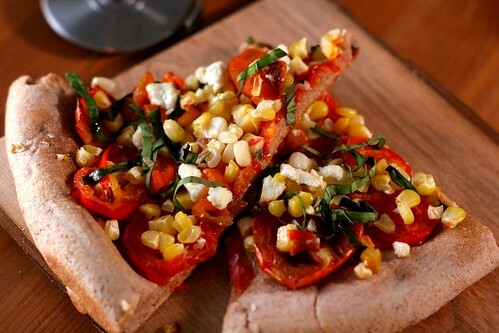 Sprinkle corn kernels and chopped pepper over the tomatoes, and top with the goat cheese. Bake in the preheated oven for about 10 minutes, until crust is crispy on the bottom and cooked through. Remove pizza from oven and sprinkle with basil. Drizzle with more olive oil and sprinkle with salt and pepper to taste. Wow what an awesome pizza! This is basically summer on a pizza crust!